Our classes meet once a week for 2.5 hours. We offer 6-week & 8-week sessions. Wheel throwing classes teach the basics of making pieces on a potter’s wheel. Students learn to prepare the clay, center, throw, and trim. After the pieces are fired, students are taught how to glaze their pieces. Dipping and painting are the main methods. For students who have taken a beginner class and feel comfortable centering clay and working in the studio. Students will learn new techniques such as closing, collaring, and making lids. Class will be led with demonstrations, along with hands-on instruction. Students are provided with the tools and clay needed for their class. Additional clay can be purchased at the studio. Students are encouraged to practice during open studio hours each week. 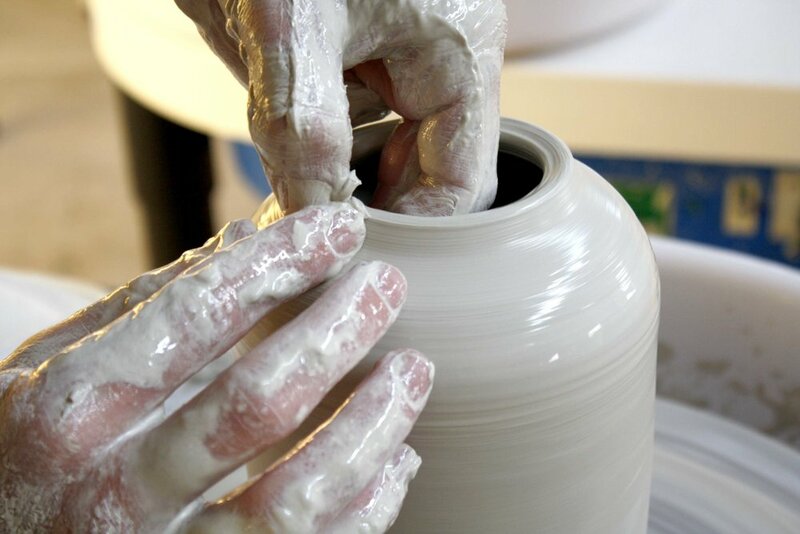 One night classes offer an energetic glimpse into the world of pottery. Classes are on Friday nights for 2.5 hours. Topics are wheel throwing or handbuilding. April & May classes are posted online. Sign-up below to receive advance notification for June/July.